Here's a movie that had me in tears of laughter before the actual movie even began. Like any movie, "Tropic Thunder," what's supposed to be a big-budget Vietnam War movie, opens with a few trailers. First up is an ad for Booty Sweat energy drinks starring rapper-turned-actor Alpa Chino (Brandon T. Jackson). Next up is "Scorcher VI," which has the tagline, "Here we go again...again," and stars dried-up action hero Tugg Speedman (Ben Stiller). Then there's the heroin-addicted actor Jeff Portnoy in "The Fatties 2," a hilarious spoof on any awful Eddie Murphy or Mike Meyers comedy. Lastly is Australian actor and five-time Oscar winner Kirk Lazarus (Robert Downey Jr.) in a role that has him receiving seductive glances from Tobey Maguire in "Satan's Alley." They're send-ups of everything Hollywood could possibly dish out, and it's only the beginning. These actors star in the latest comedy from Ben Stiller, "Tropic Thunder," which turns out to be a movie that tells the story of making a movie based on a fake true story about a Vietnam War veteran. With this and Pineapple Express released last week, it's a great comedic finish to the summer. This movie is certainly a step up from Stiller's previous movie, "Zoolander." Here, he tackles subject matter worthy of sharp satire: Hollywood. If there isn't an aspect of moviemaking that isn't ripped on here, I'd be shocked. Stiller obviously knows a thing or two about how the movie industry works along with all the things that can go wrong, and he certainly isn't afraid to exploit every detail. It all comes down to an excellent script co-written by Stiller with Justin Theroux and Etan Cohen. While outrageously raunchy, outspoken, and purposely offensive, Stiller's work here is also extremely smart in that he knows how to perfectly exaggerate Hollywood egotism and excess. 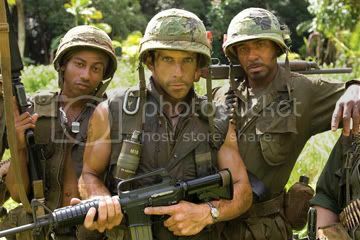 After the trailers, we're tossed into the shooting of a scene for Tropic Thunder. Frustrated with his stars and their bloated egos, the self-centered British director, Damien (Steve Coogan, soon to be seen in "Hamlet 2"), decides to make things a little more real. The movie is based on a book written by Sgt. Four Leaf Tayback (Nick Nolte, looking grizzlier than ever) who supplies Damien with the suggestion of putting the actors into the heart of the jungle to shoot the movie guerrilla style. And with an explosives expert named Cody (Danny McBride) having plenty rigged and ready to blow, they're ready to make the best war movie ever. The group of actors, including newcomer Kevin Sandusky (Jay Baruchel), doesn't realize what they're up against; that is, until Speedman gets kidnapped by the Red Army Dragon lead by a 12-year-old terrorist (Brandon Soo Hoo). From here, they're fending for their lives without a script in sight. Now, about these actors. Speedman's days of being a box office leader have faded away, and he has sunk even lower playing the ill-fated mentally handicapped lead role in a movie called "Simple Jack." In a hysterical moment by Downey, Speedman's pretentious co-star Lazarus supplies insight into how actors never win Oscars when they go "full retard." The conversation pokes fun at actors playing disabled roles in attempts to receive Oscars, not disabled people themselves. Lazarus takes his roles seriously to the point of saying, "I don't read the script; the script reads me," and even undergoes a skin pigmentation surgery for his role as an African American soldier in the movie. He refuses to ever leave character, talking with a Shaft-type dialect that quickly gets on the nerves of Alpa Chino, the real African American in the cast. And then Portnoy, who is only known for his fart humor, goes through withdrawal throughout the group's trek in the jungle, demands to be tied to a tree, then demands to be untied, and ends up naked on the back of a buffalo. Robert Downey Jr. is a force not to be messed with in his intentionally racist role. It was a dangerous move on Stiller's part, but it turned out for the very best because Downey has the acting chops to pull it off with such comic precision and genius. And there's a real black man right beside Downey's character to rip on him all the way through. Giving Downey black skin presents the shallowness of Hollywood as his character is so into himself that he couldn't possibly see why his work would be labeled as offensive. After quite a lull, Downey is definitely back and better than ever. Even better is that he doesn't steal away screen time for his co-stars Stiller and Black who have just as much fun. Both are hysterical on their own accord, especially Black who does his craziest work yet. The smaller roles all get their share as Coogen, McBride, Baruchel, Jackson, and Nolte never hold back and go all-out with their characters. The celebrity cameos are endless, as well, including Matthew McConaughey showing up as Speedman's agent who's only worried about whether his client gets TiVo. Then there's the studio head, Les Grossman, played by none other than a fat, balding, hairy-chested, and profane as hell Tom Cruise in his filthiest role ever. He's repulsively hysterical whether he's making fun of his assistant (the ever-prominent Bill Hader) or busting a dance move. It may be safe to say he just resurrected his career. The irony behind "Tropic Thunder" is that, while being satire on the making of a big-budget action flick, it turns out to be a rather big-budget action flick itself with the same level of production values as the movie-within-the-movie. It's also spot-on about its satire and frequently clever, outrageous, and shocking. Stiller understands the system through which movies are made, and he knows how to turn that into side-splitting, gut-busting, and downright hilarious humor with just the right mix of intelligence and gags that will have you laughing pretty much non-stop. Basically, he's given us the best comedy of the year.